Bella Real Estate, Inc. specializes in residential property management, residential and commercial sales, and leasing in Buda, TX. Bella translated to English means Beautiful; we strive to maintain the beauty of your property by providing exceptional property management. The town of Buda sprang up along the route of the International-Great Northern Railroad, which was extended from Austin to San Antonio in 1880. Buda bore the name of “Du Pre” from its birth in 1881 until the autumn of 1887, when postal officials became aware that another Texas town was also named Du Pre. According to town lore, the name Du Pre came from the postmaster of the nearby Mountain City, W. W. Haupt, who pleaded with railroad officials, “Do, pray, give us a depot.” Alternate unconfirmed legends suggest that Du Pre was the name of an Austin newspaper editor who may have been instrumental in bringing the depot to the future town site, or given local topography, could borrow from the French phrase “du pre,” meaning “of the meadow.” Various news sources of the time also spelled the name as Dupre or Dupree. Mrs. Cornelia A. Trimble platted the town of Du Pre on April 1, 1881, releasing streets and alleys and also establishing a 150-foot wide “Reservation” between the lots and the railroad right of way. Though the reservation was the property of town citizens, the plat allowed the railroad to place buildings on the parkland, including the depot that would become the lifeblood of the town over the next few decades. The Du Pre plat followed the convention of the neighboring city of Austin, giving east-west streets the name of local trees: Ash, Elm, Live Oak and China Streets. 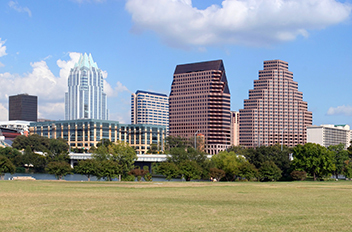 The north-south streets were named after surrounding communities: Austin and San Marcos Streets. Trimble inherited the 550 acres nestled between Onion Creek and the International and Great Northern Railroad from her second husband, A. N. Hopkins, who according to local newspaper accounts was murdered by his friend, Theodore D. Ormsby, on July 9, 1863. On July 31, 1864 the widow married David Trimble, who at some point in the 1870s abandoned his wife. The 1881 plat includes the line, “The whereabouts of said D.A. Trimble being unknown.” The lots of Du Pre were auctioned off the day after Cornelia Trimble filed the plat. A notice appeared in the April 2, 1881 morning edition of the Austin Statesman: “Du Pre – Spend Saturday, April 2, at Du Pre, on International and Great Northern Railroad, fourteen and a half miles from Austin. Great sale of lots, for business or residence. Plenty of shade and water. Bring your families and don’t forget your lunch baskets. Round trip, morning train 9 A.M., back in the evening.” On April 7, 1881, the San Marcos Free Press noted that “The sale of lots at DuPre last week went off right brisk, 17 having been sold at prices ranging from $60 to $100. Some farm lots across the tracks were auctioned off also.” Several businesses quickly sprang up in the fledgling town, including the Carrington Hotel, which became known for serving good meals to hungry railroad travelers. In 1883, the Chandler addition platted lots on the eastern side of the railroad tracks. By the time Du Pre was forced to find a new name for itself, the Carrington hotel was already being referenced as “the Buda House.” In the “Dupre Notes” weekly column of the Sept. 25, 1886 edition of the Hays County Times and Farmer’s Journal, the author notes that “The Buda House is one of the best hotels in the state. The polite and entertaining hostess, Mrs. Carrington, meets all with a courteous welcome.” According to the town’s oral tradition, the name of Buda is a corruption of the Spanish word “viuda,” or “widow,” referencing the widows who supposedly worked as cooks at the Carrington Hotel. Others suggest that, like the town of Buda, Illinois, the name is a nod to the exiles of the failed Hungarian Revolution of 1848 who settled in the area.